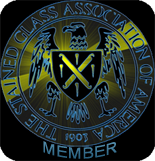 The Seal of the Stained Glass Association of America is a mark of excellence in the field of stained, decorative and architectural art glass. For over 40 years, Statesville Stained Glass, Inc., has been committed to providing excellence in Quality, Design and Craftsmanship, to the Liturgical, Educational, Healthcare Chapel, Armed Services and Residential Communities. Each of our stained glass windows is a custom design, clearly illustrating our commitment to provide and install only superior quality to each of our chosen communities around the world. Statesville Stained Glass, Inc., specializes in Traditional, Transitional, Contemporary and Custom Styles of stained glass, in both Leaded and Facetted techniques. With either selection, it will meet, not only the architectural design of the structure, but the desires and aspirations of the client, as well as any specific considerations. We take special pride in assisting each of our valued Customers in the selection of the most effective type, style, designs and color palette to enhance the beauty of the respective area, by which color can be enjoyed through the use of light. We would be pleased to come and visit with you, (at no cost or obligation), to discuss the many options that are best suited for your particular application. Just give us a call, Toll Free for an appointment– at (877) 872-5147 – or better yet, come and visit with us and see stained glass being created from the beginning, which will last for generations.